People over 75 taking daily aspirin after a stroke or heart attack are at higher risk of major – and sometimes fatal – stomach bleeds than previously thought, research in the Lancet shows. Scientists say that, to reduce these risks, older people should also take stomach-protecting PPI pills. But they insist aspirin has important benefits – such as preventing heart attacks – that outweigh the risks. And they warn that stopping aspirin suddenly can be harmful. Anyone with concerns should speak to a doctor before considering changing medication, they say. Doctors generally prescribe daily aspirin for life after a person has a stroke or heart attack to help prevent more attacks. 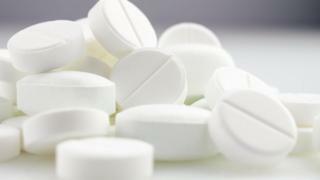 But researchers have known for some time that aspirin can increase the risk of stomach bleeds. Until now, most research involved people under 75, showing that the risk of serious bleeds was low in this group. But with around half the people on lifelong aspirin in the UK now over 75, researchers at Oxford University decided to find out whether the benefits still outweigh the risks in this group. Their study followed 3,166 patients who had previously had a stroke or heart attack and were prescribed aspirin or similar blood-thinning drugs. They found that, for patients aged under 65, the annual rate of disabling or fatal bleeds was less than 0.5% (around one person in every 200 people taking the medication). Meanwhile, for people aged 75 to 84, this rose to three people having major bleeds in every 200. And the risks of fatal or disabling bleeds continued to increase with age. Lead researcher Prof Peter Rothwell said: “Our new study gives us a much clearer understanding of the size of the increased risk and the severity and consequences of bleeds in over-75s. Dr Tim Chico, heart specialist at the University of Sheffield, described the work as a well-conducted study. But she added: “It is helpful that the researchers suggest action to mitigate this risk – the prescription of a PPI as a secondary drug – but this does raise a number of health implications. Current guidelines in the UK recommend people at “high risk” are given a PPI (proton pump inhibitor) drug which protects the stomach, along with aspirin therapy. But who exactly is at high risk is not specified. And Prof Rothwell says the majority of over-75s are not prescribed the drug. I take aspirin every day – should I be worried? Prof Helen Stokes-Lampard, head of the Royal College of GPs, says: “Patients who regularly take aspirin either as prescribed by their doctor or self-medicated, should not panic as a result of this research. Why shouldn’t aspirin be stopped suddenly? Stopping aspirin suddenly has been shown to have a rebound effect – increasing the chance of heart attack, TIA and stroke for weeks after the pill is stopped. Anyone who is concerned must discuss it with their doctor. If stopping is advised, doctors will discuss cutting down pills gradually. What about stomach protection for people under-75 given daily aspirin after strokes and heart attacks? For this group a number of previous studies show that the risk of major bleeding is low. Prof Rothwell says he would not recommend a stomach-protecting drug for people of this age. But researchers recommend anyone taking the drug should review the decision with their doctor every three to five years, to make sure individual circumstances are taken into account. What about people taking daily aspirin who haven’t had a stroke, mini-stroke (TIA) or heart attack? Researchers say the decision for a healthy individual to take aspirin must be considered very carefully and the benefits and risks to the individual must be discussed with a doctor. Do stomach-protecting PPI drugs carry any risks? All drugs have risks and benefits and the decision to take them must be made after weighing these up for the individual. When it comes to PPIs the side-effects can include flatulence, bloating and sometimes stomach infections.